Matthias Krull appeared in federal court in Miami on Wednesday and admitted to laundering embezzled funds from the state oil company PdVSA for the stepsons of an unnamed Venezuelan government official, who sources have confirmed to Univision is President Nicolás Maduro. Krull agreed to cooperate with prosecutors. Matthias Krull, a German-born managing director of a Swiss bank in Panama, pleaded guilty to one count of money laundering on Wednesday in a case that has implicated a string of wealthy Venezuelan businessmen and several as yet unnamed government officials. Federal prosecutors in Miami unveiled the case last month, the largest money laundering investigation in South Florida history, dubbed Operation Money Flight, involving allegations of massive bribery and corruption at the highest level of the Venezuelan government. Court documents mention several unnamed “Conspirators” and "Venezuelan officials", identified as President Nicolás Maduro, his stepsons and Globovision TV magnate Raúl Gorrín, according to four independent sources familiar with case who spoke to Univision. Gorrín's Miami attorney, Howard Srebnick, said he could not comment on the case, except to say that his client denied any involvement in money laundering. 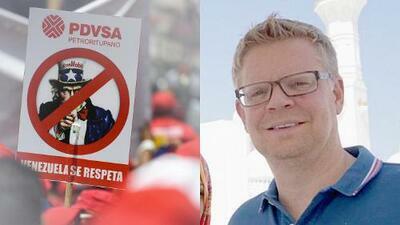 The Venezuelan government has not commented publicly on the allegations. Krull “managed ‘banking’ activities for numerous Venezuelan officials and kleptocrats,” according to court documents, which allege that he was “the personal banker” of “Conspirator 7.” In court documents 'Conspirator 7' is identified as "another reported billionaire member of the "boliburgues" and owner of a television network in Venezuela." According to the four sources familiar with the case, “Conspirator 7” is Gorrín, who controversially bought the TV network Globovisión in 2013, after its previous owners were driven out by fines imposed by Venezuela’s socialist government. The station’s news content soon moved from being critical of the government to taking a pro-government slant. As part of his plea deal, Krull admitted that Conspirator 7 asked him to launder $200 million on behalf of the stepsons of an unnamed 'Venezuelan Official 2, who the sources familiar with the case told Univision is Maduro. Krull, 44, has agreed to cooperate with federal prosecutors, potentially strengthening the government’s case. He faces up to 10 years in jail with sentencing set for October 29. Krull appeared in court wearing a beige prison suit and ankle shackles and answered questions from Judge Cecilia Altonaga in English. A lengthy summary of his role in the case read out in court by Altonaga outlined how he became engaged in what prosecutors described as a sophisticated scheme to embezzle mony from PdVSA and launder it using a foreign exchange system in Venezuela that allowed the exchange of local currency (bolivars) at a fixed rate for U.S. dollars well below the true economic rate. This created "the opportunity for fraud and abuse ... in return for bribes and kickbacks," according to the court summary. "For example, in 2014, an individual could exchange $10 million for 600 million bolivars at the true economic rate. Then, if that individual had access to the government fixed rate, he could convert that same 600 million bolivars into $100 million," the summary explained. "Essentially, in two transactions, that person could buy $100 million dollars for $10 million." The alleged conspiracy involved a series of meetings in Venezuela and Miami, and funds transferred through banks in Europe and unnamed U.S. financial institutions. The eight defendants in the case, and their uncharged accomplices, are accused of using Miami real estate and sophisticated false-investment schemes to conceal that the nature of the embezzled funds. Court documents list at least 17 properties in Miami which have been frozen by U.S. authorities, with million dollar homes totalling in value as much as $35 million. Other properties are listed in Panama. An additional $50 million has already been seized by U.S. authorities, as well as deposits in banks in the U.S, the Bahamas and Europe. So far, only two of the defendants have been arrested; Krull and Gustavo Hernandez Frieri, a Colombian-born naturalized U.S. citizen, accused of using two Miami financial firms, to launder money. Hernandez Frieri was detained last month by authorities in the Italian island of Sicily and the companies have denied involvement with him. In recent years Florida has become a popular playground for wealthy businessmen with ties to the Venezuelan government - known as "boliburgues," (short for Boli-bourgeoisie, a reference to Venezuela's socialist 'Bolivarian revolution,' named after independence leader, Simón Bolívar) - who exploited the highly lucrative currency trading business converting U.S. dollars into Venezuelan bolívars at the preferential exchange rates reserved for government cronies, as well as access to state oil company contracts. Krull admitted that the conspiracy began in December 2014 and by May 2015, the conspiracy had doubled to $1.2 billion. Krull joined the conspiracy in or around 2016 when a co-conspirator contacted him to help launder the money. Krull admitted in court that the false-investment laundering schemes involved money managers, brokerage firms, banks and real estate investment firms in the United States and elsewhere, operating as a network of professional money launderers.